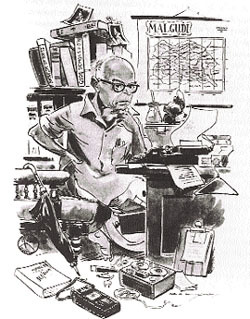 On the 10th anniversary of his passing away, The Guardian, London, has a long piece on the legendary creator of the fictional town of Malgudi, R.K. Narayan, with churumuri‘s own Sunaad Raghuram quoted in it. churumuri‘s 2006 campaign for keeping Narayan’s memory alive in Mysore, by renaming a Mysore-Madras train as Malgudi Express, connecting the two cities Narayan was connected with, also finds passing mention. “There is at least one place in Mysore where you can put your finger on the elusive RKN – at his former home, up in the northern suburb of Yadavagiri. It was built to his own specifications in the late 1940s. “The area, then rustic and isolated, is now a leafy street in a pleasantly breezy uphill location, but the house stands empty and rather forlorn, with a look of out-of-date modernity – two storeys, cream-coloured plaster, with a stoutly pillared verandah on the first floor. “The idiosyncratic touch is a semi-circular extension at the south end of the house, like the apse of a church. On the upper floor of this, lit by eight windows with cross-staved metal grilles, he had his writing room. “It had such a splendid view over the city – the Chamundi Hill temple, the turrets and domes of the palace, the trainline below the house – that he had to curtain the windows, “so that my eyes might fall on nothing more attractive than a grey drape, and thus I managed to write a thousand words a day”. “A few hundred yards up the street stands the smart Hotel Paradise. The manager is Mr Jagadish, a courteous and slightly mournful man with a neat grey moustache. He knew Narayan in the 1980s, when he would sometimes dine at the hotel with his equally famous younger brother, the Times of India cartoonist, R.K. Laxman. “I ask what he was like, but it is Laxman who stands out in his memory. Laxman was “very funny”, and had opinions about everything, but Narayan was “more serious”. He was a modest man, he didn’t “blow his trumpet”. “Sometimes, says Mr Jagadish, he has guests who ask him: “Where is Malgudi?” He laughs and taps the side of his head. For a moment I think he is giving an answer to the question – that Malgudi was all inside one man’s head – but what he means, of course, is that the question is daft. This entry was posted in Literati, Mysore-Bangalore, R.K. Narayan Campaign, Rajas & Maharajas and tagged Chetan Krishnaswamy, Churumuri, James Fennelly, R.K. Laxman, R.K. Narayan, R.S. Krishnaswamy, Sans Serif, Sunaad Raghuram, T.S. Nagarajan, T.S. Satyan, The Guardian, Ved Mehta, Yadavagiri. Bookmark the permalink. Malgudi is of course THE place where we all wished we lived. Do you have a high resolution version of the illustration…? We could atleast have Malgudi on our computer desktops. “Waiting for Mahatma” by R.K. Narayan is my favourite book. This is the best book that he has written. You can’t read Waiting For Mahatma without being filled with an amazing sense of nostalgia. Narayan and his umbilical cord to Maisuru are back at Churumuri after a hiatus. Rejoice. This sort of hagiography is getting to be a bit grating — especially when much of it seems to be nepotistic. I would rather that we discussed RKN’s fine work. 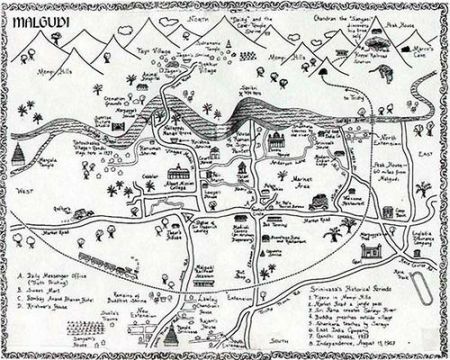 I agree with Vijay, we’d love to have the Malgudi map. And sad, not many celebrate the anniversary, really sad. Guess, we just cannot love Malgudi enough. if you are so hell bent on dreaming. Our house is next door to the “smart hotel paradise” in Yadavagiri. I had occasion to meet RKN. I was not sure when I was welcome. Sometimes during my evening walk when I dropped in, he would welcome me. But not always. There are two things that come to my mind when I think of my visit to his house. One was my attempt to discuss politics. I had attempted to enter politics to walk the talk and lost deposit. RKN was a nominated member of Rajya Sabha. To my surprise he cut me short by telling me that he is not interested to discuss politics. Though I did not ask him why he was then in Rajya Sabha, I felt disappointed that why the government has nominated some one with no interest in politics. The other event I recall was when Mysore Grahakara Parishat was fighting to preserve Kukkerhalli lake. At the suggestion of the Editor of Star of Mysore, I wrote to RKN who had by then moved to Chennia. I did not expect any reply. It was not the internet age. To my surprise I did receive his reply giving full support to our fight. With the hind sight I wished that I had made use of being his neighbour and got to know him better and his Malgudi town. I lost that golden opportunity. The intro could have been: On the 10th anniversary of the passing away of R.K. Narayan, the legendary creator of the fictional town of Malgudi,…. As everyone knows, Shankar nag shot malgudi days in Agumbe. Even though many of you might of visited Agumbe’s sunset point but only few might have explored the house where the malgudi days shooting was done. I suggest everyone to visit that big old bunglow and enjoy the malenadu “Kashaya”. That poor house is flocked by weekend IT types, poor folks treat all of them to kashaya. Most of the places of Malgudi could be matched with Mysore of yore and perhaps with Madras of his childhood, also, the nearest airport is in Trichy!